"I've had such a good time. " 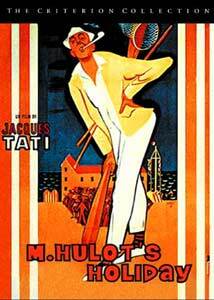 Like many of the artists in their catalogue, Criterion's M. Hulot's Holiday (Les Vacances de M. Hulot) was my first encounter with writer/director/actor Jacques Tati. I am not much of a fan of slapstick comedy, as most of the time I find it too silly or overdone to the point of finding myself saying "enough already." As such, when M. Hulot's Holiday came up for review, I was somewhat hesitant as to whether I would find anything to like in it, after forcing myself through Criterion's W.C. Fields shorts collection not that long ago. The description of the Hulot character was a bit deceiving, as he does manage to create enough havoc during the course of the film. But it isn't the silly, over-the-top sight gags I was expecting; more a string of accidents that M. Hulot gets involved in, unwittingly and naively. Nominated for an Oscar® for best writing, story and screenplay, this was the first of four Hulot entries, which also include Mon Oncle (1958), Playtime (1967) and Trafic (1971) and only Tati's second feature. Shot at Saint-Marc-sur-mer in France, M. Hulot's Holiday takes us back to lazy summer days and nights at a yearly vacation retreat. The site and sound gags are evident from the opening frames, as a crowd of holiday seekers scrambles from platform to platform trying to anticipate the incoming train, whose announced arrival features the all-to-common indistinguishable public address announcement. When we first meet our story's main character, M. Hulot, he is making his way by motor car (backfiring and stuttering in contrast to the full-sized autos passing him) to the Hotel de la Plage, a seaside resort that we assume is a regular summer retreat. As he reaches his destination, we are introduced to the ensemble cast who make up the group of vacationers M. Hulot will spend his summer with. There is the young girl and her aunt, an English woman, a family, a pair of older people, the commandant and his wife, and the hotel waiters. We observe them in their daily routines, going to the beach, attending to their meals and so forth. Invariably M. Hulot will find some way, either directly or indirectly, of getting himself in a situation, whether he is really at fault or not. No serious harm is done, though Hulot does try to steer clear of the hotel proprietor, who doesn't appreciate the monsieur's distractions. Dialogue doesn't play an important part in this film, and is almost inconsequential, as the first line isn't delivered until nearly 15 minutes in, and even then serves more as atmosphere than a means of driving the plot. That is not to say that audio is unimportant, it plays a vital role through sound effects and cues that accent the visual comedy being presented. Rather than examine his characters through closeups and facial expression, the audience is placed in the role of observer, reading body language as one does at a distance. Camera perspective is also a key ingredient in Tati's work, as many of the gags rely more on what we can't see than what we can. In the end, we have a charming little film, exuding those long lost summers of days gone by, and all the little mishaps that the gangly M. Hulot encounters along the way. What I liked is that the humor is often subtle—the jokes aren't forced—yet they have the desired result, most of the time. The atmosphere is one I can see wanting to return to, the characters are given the kind of coverage one would experience in real life on such a vacation, with little glimpses into their personalities. And in the middle of it all is M. Hulot, accidentally putting his foot in it, then making more of a mess trying to get himself out. Whether he's out boating, playing tennis or just driving through countryside, M. Hulot is a force to be reckoned with. M. Hulot's Holiday is the same U.S. cut that Criterion had previously issued on laserdisc, this time with the addition of the French language soundtrack, which the laserdisc didn't have. The film, as originally released in France, reportedly adds an extra 18 minutes to the runtime. Image Transfer Review: The black and white full frame image is in nearly immaculate condition, with only the odd, and mostly inconspicuous blemish appearing from time to time. Sharpness does depend on the scene, with some better than others, and midtones and blacks are well preserved in their full spectrums. While not entirely perfect, it is nonetheless a very nice looking presentation. Audio Transfer Review: Criterion provides the original French soundtrack in a very good mono presentation. Hiss and distortion are nowhere to be found, and the big band interludes don't sound oversaturated as many do. As an added feature to showcase Tati's attention to the soundtrack, an alternate English version is also included. Extras Review: Included on the disc is a 3-and-a-half-minute introduction to the film by the multifaceted Terry Jones (Monty Python), which gives a nice perspective on M. Hulot's Holiday, though the bit does contain a number of references to the film that would be best discovered in context, so newcomers should save this until after their first viewing. We also get Soigne ton gauche (1936), a 12m:25s short by director Rene Clement (Les Félins, Purple Noon), written by and starring Jacques Tati as a would-be boxer. While the source print is a bit worn, this still looks very watchable, and gives another look at the actor/director's work. Criterion's standard color bars are also included on disc, and an essay on Tati and the film is contained on the trifold insert. With M. Hulot's Holiday, I found my introduction to Jacques Tati to be completely unlike what I had expected. Tati's funny yet subdued humor is relayed through a series of vignettes which make up a summers' activities, leading to an explosive finale. I hope Criterion continues to offer Tati's work as they have here, with supplemental shorts from this brilliant artist's career.